Law Enforcement in Tri Cities needs you help identifying subjects involved in a complex credit card fraud case. The suspects used information obtained from a credit card skimmer to then withdraw cash from multiple victims. The suspects are likely traveling across the country making identifying them difficult. 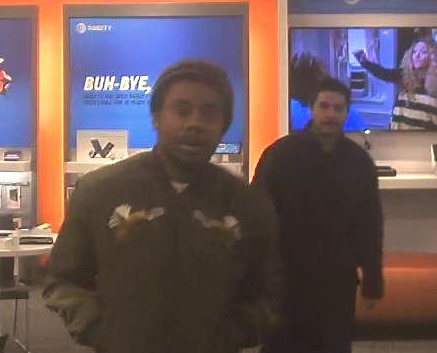 Kennewick Police need your help identifying these two people in connection with the theft of a $1250.00 Phone from a Kennewick business on January 16, 2019. 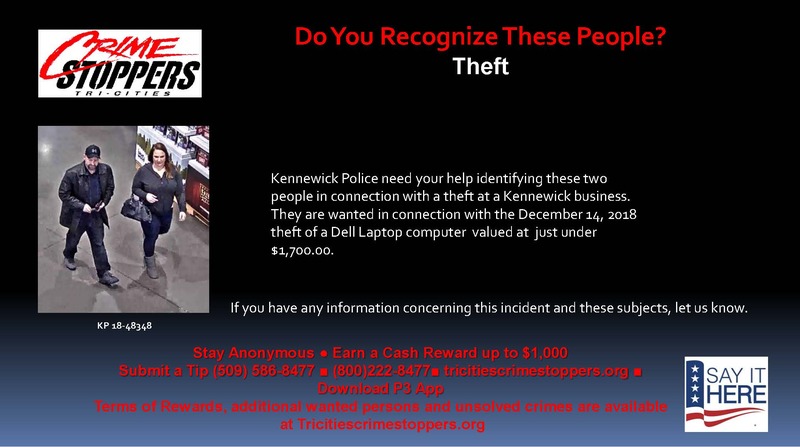 Kennewick Police need your help identifying these two people in connection with the theft of a Dell Laptop computer from a Kennewick business on December 14, 2018. 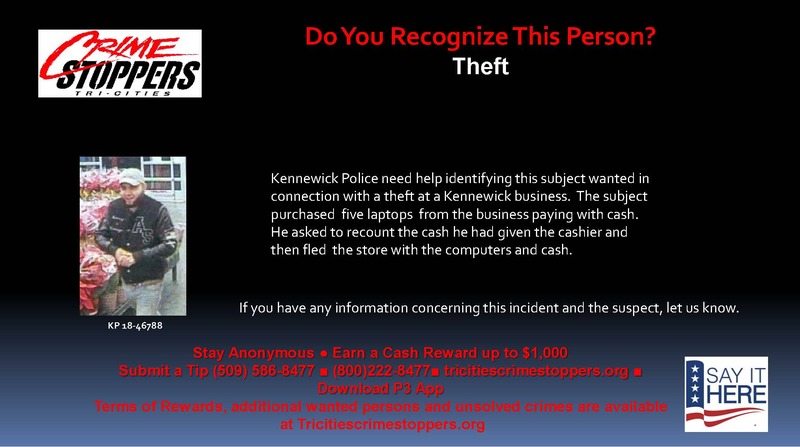 Kennewick Police need your help in identifying this suspect from a Kennewick business. 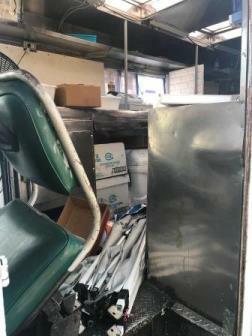 The suspect paid cash for five lap top computers and then left with the cash and computers after asking for the cash back to recount it. On November 20, 2018 at 6:30 PM this unknown person entered a business in the 700 blk N Columbia Center Blvd. They hid inside the business until after it closed for the evening. 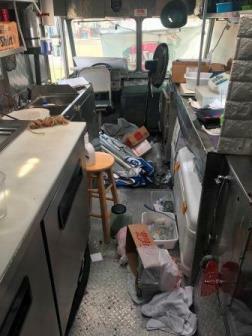 The suspect then came out of hiding stealing cash and damaging the business. 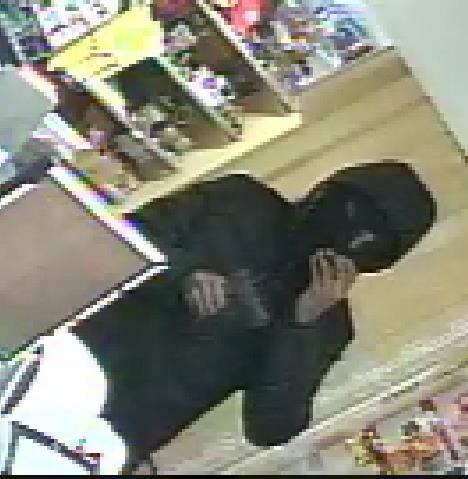 While the image isn't great, perhaps you recognize something about them that will help solve this burglary. 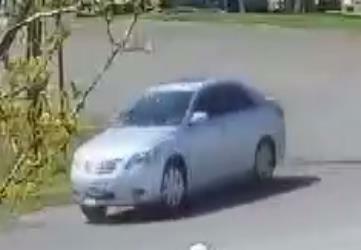 Kennewick Police need help identifying anyone involved in a series of fires in Kennewick’s Zintel Canyon. 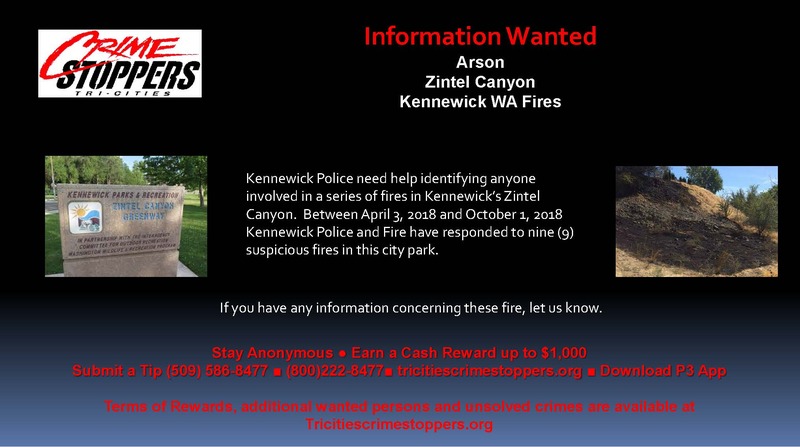 Between April 3, 2018 and October 1, 2018 Kennewick Police and Fire have responded to nine (9) suspicious fires in this city park. vandalizing it, cutting wires and damaging appliances. Have you have heard of the scam where the victim provides a con artist with gift card numbers and pin codes over the phone after being convicted they owe money? In this case the 78 year old victim was in Baton Rouge LA and some of the gift cards were used at a Kennewick business around June 14, 2018. This subject is suspected in using those cards. 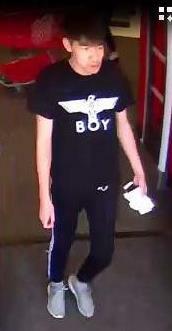 Help us identify him. 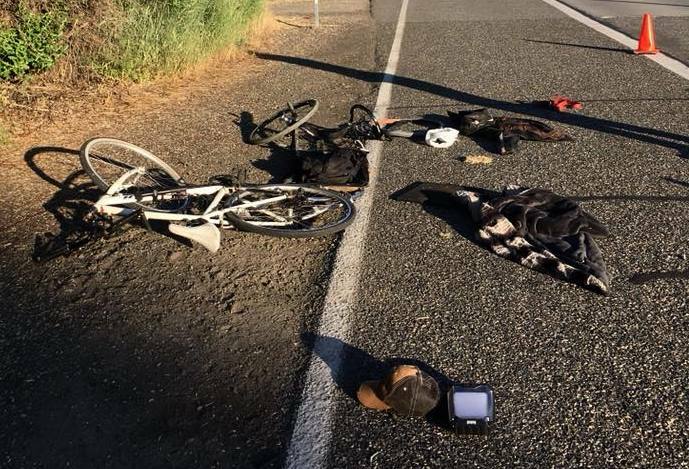 Kennewick Police need your assistance in finding the suspect and vehicle involved in a hit-and-run traffic collision early Sunday morning, May 27, 2018. The collision happened on Columbia Park Trail near Edison Street. The suspect vehicle collided into the trailer of a bicyclist and drove away without stopping. 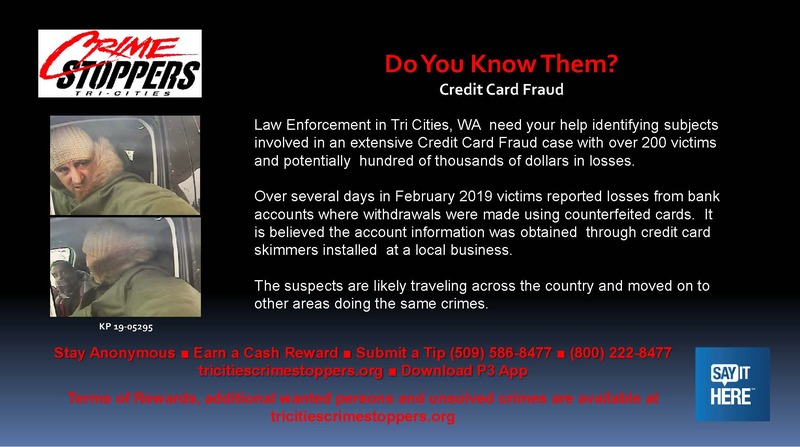 Benton County Sheriff's Office & Tri Cities Crime Stoppers need your help in solving an armed robbery in Benton City WA on April 24, 2018 at 11:08 AM. 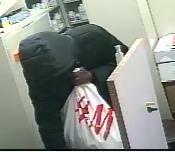 The Benton County Sheriff’s Office responded to an armed robbery at Logar Pharmacy, 516 9th Street, Benton City, WA. The suspect was described as a black male, about 6' and a thin build. 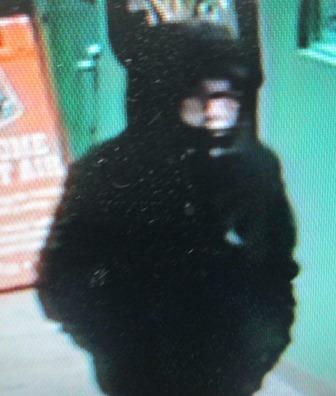 He was wearing a mask, black coat , black sweatpants and was armed with a black handgun.